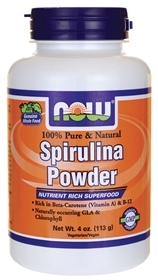 Spirulina Powder - 4 oz. Spirulina contains the highest protein and beta-carotene levels of all green superfoods, and is also a rich source of GLA (Gamma Linolenic Acid), a popular fatty acid with numerouse health benefits. In addition, it is the highest known vegetable source of B-12 and provides optimum levels of vitamins, minerals, trace elements, cell salts, amino acids and enzymes. For vegetarians, spirulina is 65-70 percent complete protein compared to beef, at 22 percent, and lentils, which is about 26 percent. Spirulina is the highest source of B-12 as well. Today, these nutrient-rich algae are being used around the world to help treat illness and are being seriously discussed as a sustainable source of food with the potential to end world hunger. Unlike most plants, which need to be cultivated and nurtured, spirulina is a survivor, able to withstand extreme temperature variations and neglect and still thrive. Suggested Usage: As a dietary supplement, take one level tablespoon one or more times daily, mixed in water, fruit or vegetable juice. Consider taking this product in combination with NOW® Bee Pollen, Lecithin and Chlorella.